The term ‘medically unexplained symptoms’ although historically widely-used has recently been replaced by labels which are less stigmatising to the patient and, at the same time, acknowledge the uncertainty that continues to inform somatoform syndromes. In this study, the term ‘Persistent Physical Symptoms’ (PPS) is used to describe these conditions. It is estimated that between one third and one half of all patients referred to out-patient clinics present with impaired functioning which either lacks or is insufficiently explained by structural or neurological pathology. Consultants frequently describe this population as disproportionately time-consuming and difficult to treat. Service users report that their symptoms and concerns are frequently dismissed during consultations. Sitting at the intersections between mind, body and brain, somatic pathology challenges both the current structure of specialised medical disciplines within the general hospital, and the lack of integration between psychiatric and medical services. 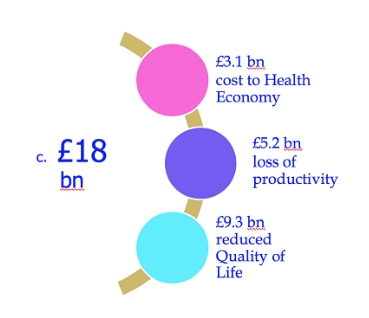 In addition to the distress and disability experienced by somatising patients, the cost to the annual UK economy is approximately £18 billion. Understanding of somatoform disorders focuses on the relationships between predisposing, precipitating and perpetuating factors. 3) Neuroticism: a personality trait referring to a stable, life-long tendency to experience negative affect and somato-psychic distress (Watson & Pennebaker, 1989). 13) Psychiatric co-morbidities: predominantly high levels of anxiety and moderate to severe depression. Most of the patients who attend the Persistent Physical Symptoms Group struggle to articulate their feelings. Most have impaired mentalization skills; some also are alexithymic. 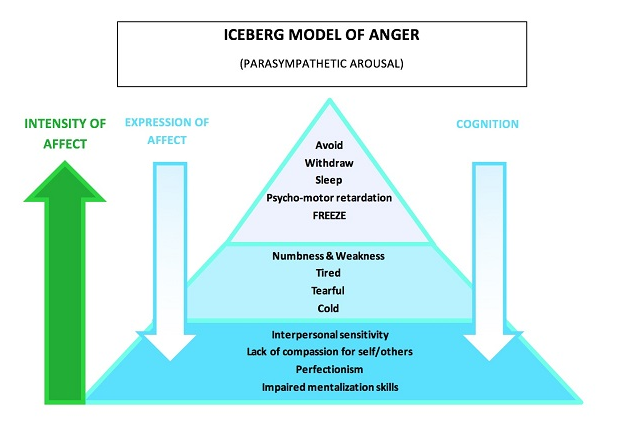 Many experience anger with inter alia their families, friends, physicians – and their symptoms, although many are unable to express this emotion. 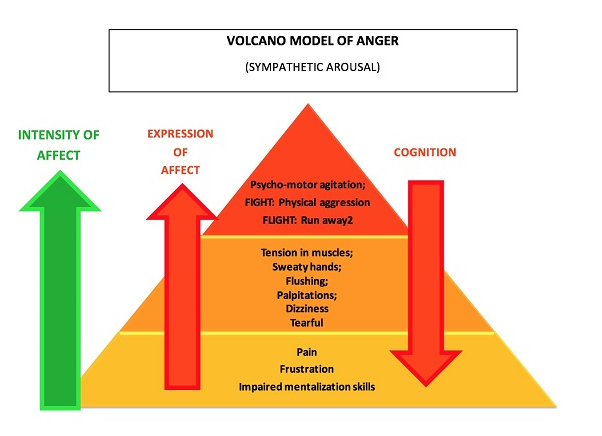 The two models of anger (Volcano and Iceberg) are graphic depictions of the autonomic arousal system. Patients report that the diagrams help them understand how they typically cope with distress. Individuals may demonstrate hyper – or hypo – arousal, although some may ‘yo-yo’ between the two arousal states. A main objective of the Group protocol is to expand participants’ ‘Window of Tolerance’ (Fisher, 2008) and enable them to tolerate simultaneously feelings and reactions. Learning to react appropriately to situations - and practising new behaviours in the safe space of the Group – enables participants to give up previous self-sabotaging behaviours. In this way, emotional regulation and assertiveness skills are expanded. Mindfulness exercises are practised on a regular basis, using all 5 senses. The scent of a rose and the colour and texture of its petals helps ground patients in the present moment, as does the crunch and taste of popcorn or the juice of ripe berries as it squirts out of the fruit. For some patients, focused attention is better achieved through the sound of rain or waves crashing on rocks. These exercises undermine patients’ tendency to ruminate and help them focus attention, thereby weakening their often disproportionate focus on their symptoms. (Mindfulness breathing is not included as there is evidence that anxious individuals may struggle to focus and become even more anxious). Extreme health anxiety is not uncommon amongst sufferers of conversion disorders, and somatisation and other related disorders (DSM-5 (2013), 300.7, 330.82, 300.89, 300.11; ICD-10 (1992), F44.4-44.9, F.45.1-45.9). Dismantling idiosyncratic and dysfunctional illness beliefs and narratives helps undermine some of their rigid fears. Enhancing emotional and psychological flexibility is a key objective of the Group protocol. 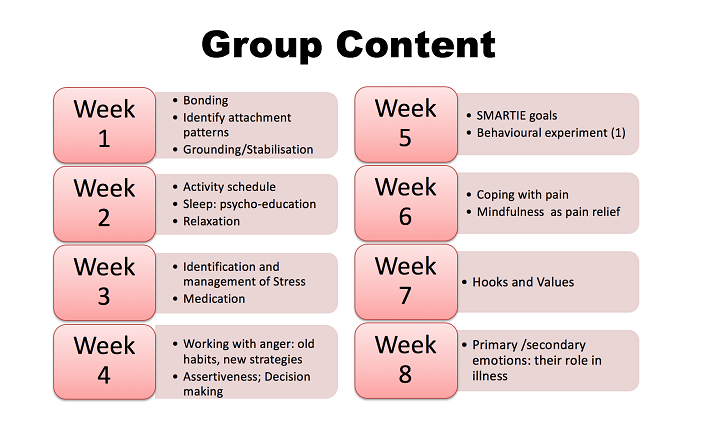 Weekly homework is given in order to reinforce the work of the group, allow participants to reinforce their progress and to help measure their motivation to recover. An important between-session task, for example, are the somatic & behavioural experiments that reflect the values identified by group members as important to their life. Potential obstacles to the success of the experiment are identified at the design stage and strategies devised to overcome them. Perfectionist tendencies – as frequently seen in ‘boom or bust’ activities’ are similarly pre-empted at an early stage. Review of the experiment allows patients to acknowledge success, thus boosting their sense of self-efficacy and self-esteem. Partial success demands that patients learn to adapt and develop flexible expectations. Dealing with disappointment leads to group work on self-compassion. Relapse prevention and resilience skills inform the later stages of the group. The Resilience Box serves both as a ‘transitional object’, a connection to the group, as well as a rapidly accessible resource in challenging times. Note on materials: all materials used have been developed or modified for use with somatic conditions. As this patient population tends to tire easily and may have impaired concentration and memory, materials rehearse the teaching of the session as well as introduce new tasks. The materials have been designed so that they can also be used with patients with mild learning difficulties. The 3 and 6 month follow-up offers an opportunity for patients to reflect on how they have managed without the weekly support, and to identify any new challenges. Male and female patients between the ages of 18 and 65 with chronic functional symptoms, often (but not always) involving multiple body systems, were referred by the acute general hospital. Following an extensive biopsychosocial assessment, those who met the criteria for inclusion were invited to attend the group intervention. Each group had a maximum of eight participants. Patients’ conditions included conversion disorders, non-epileptic attack disorder, movement disorders, gastro-intestinal, respiratory disorders and somatoform (pain) disorders. Patients who were floridly psychotic and those who did not possess adequate English language skills were excluded from the group. All the measures used were based on self-report. Warwick-Edinburgh Mental Well-being Scale (WEMWBS, Stewart-Brown et al, 2008), is a 14 item self-report Likert scale of mental well-being covers subjective well-being and psychological functioning. Items address aspects of positive mental health. EuroQual - 5Dimensions (EQ-5D, Lamer et al, 2005), is a generic self-report instrument for measuring health-related quality of life measures that can be translated into costs to the health and wider economy. Five domains are evaluated: mobility, self-care, pain/discomfort, anxiety/depression, and ability to perform usual activities. A visual analogue scale (EQ-VAS) provides a snapshot of the patient’s health status. Scale for Evaluating Physical Symptoms (SEPS, Tyrer et al, 2012). Patients report their main physical symptoms, their persistence, severity, and chronicity. A Likert- type scale measures the severity of their most disabling symptom, its impact on their ability to exercise, and evaluates whether they consider that they need further investigation. This measure is currently being adapted to include patients with functional neurological conditions as well as those who present with co-morbid disabling psychiatric illnesses. 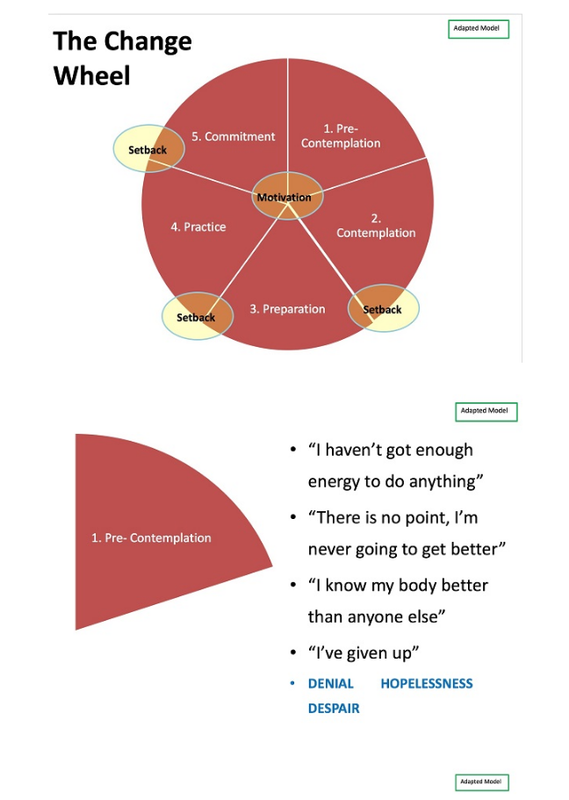 Mood and Motivation Measure (MMM, Scheiner, 2012, unvalidated) is a quantitative and qualitative measure of the patient’s perception of their engagement and belief in the recovery process. Twenty-five items are framed in a mixture of both positive and negative terms. Answers are scored on a Likert scale. The Measure also includes two questions that ask the patient to reflect on what else they need to do to enhance their progress. Toronto Alexithymia Scale (TAS-20, Bagby et al, 1994) is a 20 item measure of the individual’s ability to identify and measure emotions. Respondents’ answers are scored on a Likert scale. Health Anxiety Inventory (HAI, Salkovskis, 2002) is used with patients who present with hypochondriasis. Fourteen items evaluate current symptoms and the patient’s ability to be reassured by results that do not detect abnormal pathology. Four subsequent items ask the patient to imagine the impact on their quality of life of being diagnosed with a life-limiting illness. Karnofsky Scale is a clinician-administered performance rated scale of the patient’s current presentation. This measure is currently being adapted to capture a more nuanced record of the patient’s functioning, for example, their mentalization skills. Participants also completed a demographic form documenting their health care over the previous year, including GP and outpatient consultations, procedures and investigations and hospital admissions. The form included space for them to describe both their illness beliefs and recent stressors. Possible stressors included childhood or adult trauma, parental physical and mental health status and financial worries. At the end of the 12 sessions, patients complete a Feedback form which includes an evaluation of the progress they have made and asks them to identify SMARTIE goals for the next three and six months. The findings to date indicate that patients improve their quality of life and reduce their number of unplanned GP and consultant appointments independent of improvements in their physical symptoms. Quantitative and qualitative data indicated greater emotional awareness and improved quality of life, independent of physical symptoms. Health care utilisation decreased. These benefits were maintained at three month follow-up. 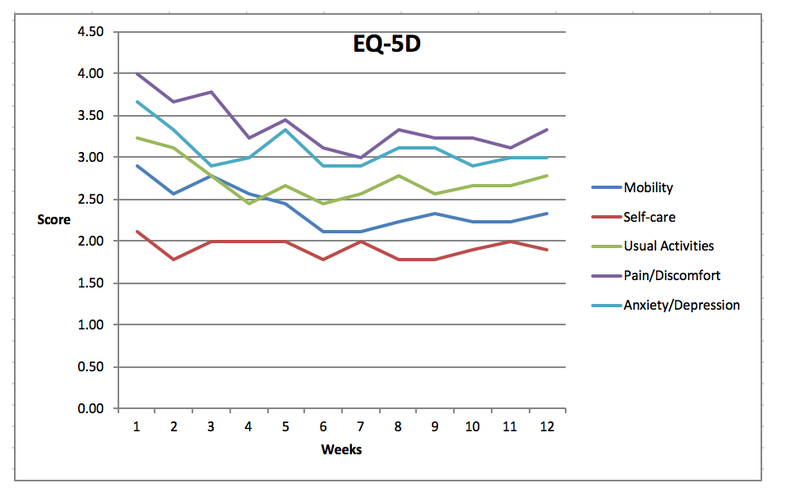 The EQ-5D descriptive system and the EQ VAS descriptive system comprises the following 5 dimensions: mobility, self-care, usual activities, pain/discomfort and anxiety/depression. The Graph shows that over the life time of the Group, each dimension decreased in levels of severity, which means that patient’s quality of life improved as the weeks continued. The WEMWBS is a a measure of 14 positively worded items with five response categories, for assessing patient’s mental wellbeing. The WEMWBS graph shows that patients scores increased from 37.5 to 40.00, demonstrating a meaningful improvement in patients' wellbeing over the course of the 12 week sessions project. It is planned to add both weekly physiotherapy and occupational therapy. The aims are to improve patients’ mobility and reduce pain and discomfort, whilst at the same time, increasing their repertoire of activities and the pleasure they derive from performing them. Group interaction promotes both psychological understanding and affect regulation. Enhanced cognitive flexibility promotes adaptive illness behaviours. The protocol is a low-cost intervention per quality-adjusted life-year (QALY). Patients with co-morbid narcissistic personality disorder require individual treatment before joining the group. Motivation to change fluctuates in this patient population. American Psychiatric Association. (2013). Diagnostic and statistical manual of mental disorders (5th ed.) (DSM-5). Barsky, A.J. and Borus, J.F. (1999). Functional somatic syndromes. Annals of Internal Medicine, 130: 910-21. Derakshan, N., Eysenk, M.W., and Myers, L. (2007). Emotional information processing in repressors: The vigilance-avoidance theory’. Cognition & Emotion, 21(8): 1585 — 1614. Edward, M.J. and Bhatia, K.P. (2012). Functional (psychogenic) movement disorders: merging mind and brain. Lancet Neurology, 11(3): 50-60. Fisher, J. (2008). Psychoeducational aids for working with psychological trauma. Center for Integrative Healing: MA. Halligan, P.W., Bass, C. and Oakley, D.A. (2003). Malingering and Illness Deception. Oxford: O.U.P. Kano, M. and Fukudo, S. (2013). The alexithymic brain: the neural pathways linking alexithymia to physical disorders. BioPsychsocial Medicine, 7:1. MacLeod, A.K., Haynes, C., and Sensky, T. (1998). Attributions about common bodily sesnations: their associations with hypochondriasis and anxiety.Psychological Medicine, 28: 225-28. Prochaska, J. and DiClemente, C. (1983). 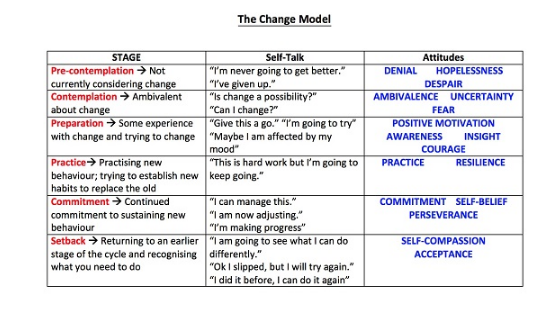 Stages and processes of self-change in smoking: toward an integrative model of change. Journal of Consulting and Clinical Psychology, 5: 390–395. Watson, D. and Pennebaker, J.W. (1989). Health complaints, stress and distress: exploring the central role of negative affectivity. Psychology Review, 2: 234-54.